The sun is showing its face here in the Pacific Northwest. Spring was late to come so it is especially appreciated this year. 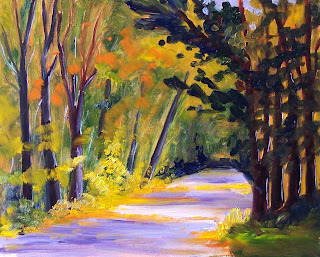 A walk at Point Defiance Park in Pierce County, Washington this past week was inspiration for this 8x10 oil painting. Five Mile Drive in the park is a great place to experience warm weather. The sunlight flickers through the trees and makes the journey feel like a fairy tale. Late afternoon sunlight inspired this painting. The glare of light through the trees and the brilliance of the sunlit grass are wonderful reminders of the long summer days to come. This painting is a 5x7 inch oil on gessoed hardboard. This cow gave me the evil eye; apparently I am a disruptive influence. It must be a cow's desire to eat, sleep, and rest without the distraction of pesky humans. She was a fun subject in spite of the evil eye. This rendering was completed on a 9x12 stretched canvas with professional grade artist oil color. I especially liked using Gamblin's Tranparent Earth Red on this reluctant subject. The paint has a rich depth that I especially appreciate. In the midst of the gas crisis, I feel fortunate to be able to get away for a couple of days and travel a bit in Western Washington State. On my travels, I captured this image of a barn sitting on a hillside. The trees have bloomed and the sun is out. It feels good to be alive. The painting is 5x7 inches on a gessoed hardboard panel. The apple trees are blooming and it won't be long until we are harvesting. 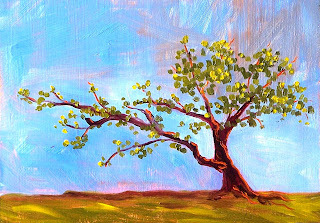 This little painting was inspired by an apple tree in my backyard. It is graphed to produce five different kinds of apples. When fall comes and the fruit begin to fall, apple pie, apple strudel, baked apples, apple jelly, and anything else apple that I can cook begins to emerge from my kitchen. Friends and neighbors with a bucket and a few spare minutes are always welcome to share in the wealth my tree produces. 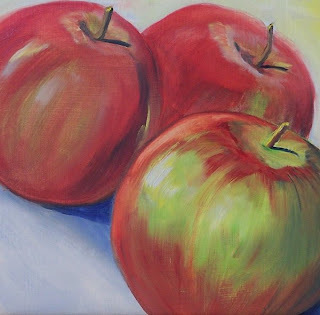 I've painted apples often in the past, but haven't done so recently, so this one is a wonderful reminder of how enjoyable it is to reproduce their beauty with paint. This painting is 6x6 inches on a gessoed hardboard panel. This mangled old tree is a reminder of a trip I took to the Pacific Coast of Washington State. The weather had beaten it and shaped it, but it continued to reach for life. I had to recreate it in oils on a 5x7 inch hardboard panel. It is available to add to your collection of small format art by clicking on this link to my Etsy Shop. The price is $35.00 plus $6.50 for shipping to US addresses. 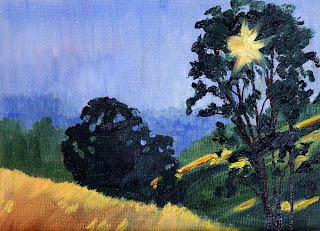 This little 5 x 7 inch oil painting is of a scene I have painted often. The Nisqually Delta in Washington State is a valley dotted with little scrub trees such as these. A grassy marsh, wildlife, and open space characterize this delightful patch of landscape. This has been a very busy weekend. I've been framing paintings, worked on a larger painting most of the weekend, and updated my Etsy store to include this little 5x7 oil painting. It was inspired by a spring drive through the Skagit Valley of Washington State. Although it is a reminder of some fond memories, I need to move it out into the world. You can add it to your collection by clicking here. The weather is hot and the colors are too. It was fun painting this 8x10 inch oil painting. 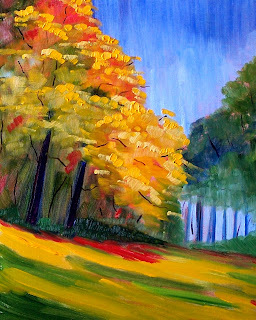 I began with a red underpainting and added the colors of fall. Cadmium yellow, Naples yellow, Grumbacher red, Ultramarine blue, Sap green, and white were the colors that made up my limited pallette. 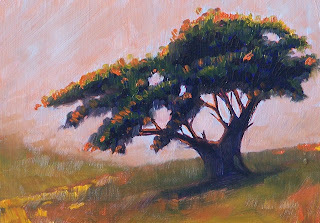 This little tree painting began with an orange wash. 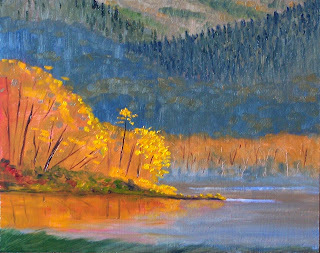 I like the colors of fall and the underpainting provided a good start on the autumn color scheme. I imagined the cool mist of an October fog as I painted. 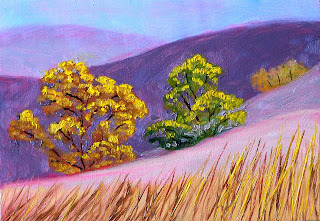 The painting is 5x7 inches on a gessoed hardboard and was created using professional grade artist oil color. I listed it today in my Etsy shop. You can add it to your collection of small format oil paintings by clicking here. 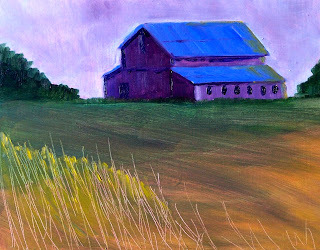 Sometimes it seems like every barn I see is either red or unpainted. It was a delight to see this one with a blue metal roof. 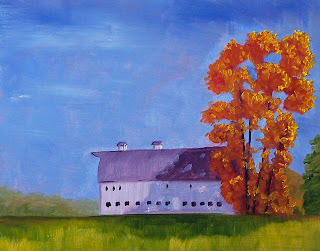 Even in the early morning light, the blue of the roof stood at attention demanding that I paint it. It is 8x10 on gessoed hardboard. I've been working on some larger works and researching some new techniques, but I took some time out to do this little 5x7 oil painting of a couple of ladies on an afternoon out. 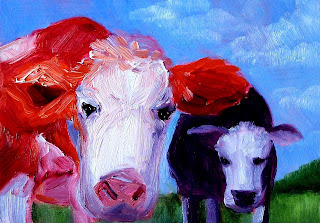 Painting cows has turned into a quick and pleasurable adventure for me. A delightful little series of these gals is beginning to develop. 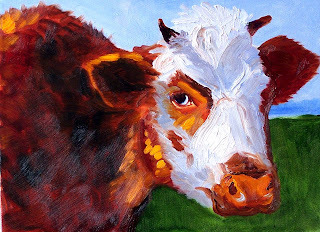 You can see some of my other cow paintings here, here, here, and here. 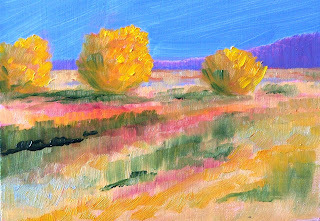 Scrub trees growing in a sand dune inspired this 5x7 inch oil painting. It is amazing that anything can grow in a sand dune where the water sifts quickly downward and the soil is gritty. Somehow scrub trees and dune grass resolutely make their claims in such places. I admire the tenacity of such organisms. I'm sure there are days when we all feel like the tree in the sand dune. As summer approaches, I will be taking advantage of the longer daylight hours and listing fewer paintings for sale in my Etsy shop . But today, you can purchase it for $35.00 plus $6.50 for shipping to US addresses by clicking here. I also ship world wide; if you click here and scroll to the bottom of the page, you will find shipping expenses for everywhere else. 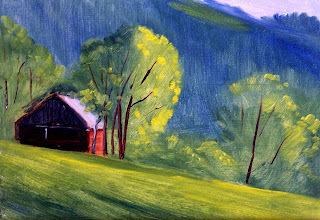 The shadows on the barn were the focus of this 8 x 10 oil painting. Pre-mixing colors and concentrating on values was the inspiration for creating it. A photo taken last fall of the Brown Farm Barn at the Nisqually National Wildlife Refuge in Washington State was my resource. My palette was limited to Quinacindone Red, Ultramarine Blue, Cadmium Yellow, Sap Green, and Titanium White. Good practice and a fond memory resulted from this effort. 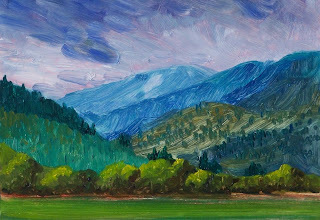 In February I painted this 8 x 10 landscape oil painting. It was during the dark days of winter with rain pouring and cold. It helped me recall the earlier, more hospitable season of fall. The color of the trees and the reflections in the lake elevated my spirits. Now that spring is here and my studio is over flowing with paintings, I've decided to list this painting in my Etsy shop. You can purchase it for $80.00 plust $12.00 for Priority shipping to US addresses by clicking here. As the snow in the mountains melts, creeks begin to fill with spring run off. The snow pack is critical for people of the northwest. Although it was difficult to deal with record snowfall in the mountains this past winter, it is the run off that keeps us from drought in the summer months. 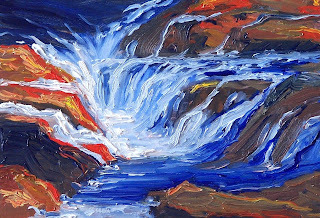 This 5x7 inch oil painting was inspired by a frothing creek in the Cascade Mountains of Washington State. 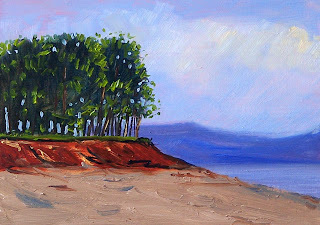 This little 5x7 inch oil painting represents erosion that was typical on many waterfront parcels in the Puget Sound this past year. With heavy winds, high tides, and pouring rain, Mother Nature helped cloak them in new attire.